With Ben working in the event industry, the wedding planning process couldn’t have been easier. The wedding day began with the bride and groom getting ready in separate rooms, surrounded by their closest friends and family members. For the bride, she couldn’t wait to experience their first look – a moment she had been looking forward to ever since she started planning the wedding. An elegant white and gold wedding reception followed, featuring arrangements of white florals and white orchids hanging from architectural gold centerpiece structures. The dancefloor was lit with varying shades of purple and blue, and custom videos played onstage while the DJ kept everyone partying throughout the night. The newlyweds honeymooned in Italy, Israel, and Greece. After fully experiencing the wedding whirlwind, they were excited to take some time to themselves, traveling and simply enjoying being with one another. Trendy Wedding Ideas with Marble, Quartz, Calligraphy, and more! As wedding season was quickly approaching I knew creating a beautiful shoot just had to be done. My thought was to focus on the 2016 wedding trends and so I teamed up with Heather Puhek, owner of Petals & Stones and hair and makeup stylist for Beauty and the Beach, to start the planning process. We were inspired to highlight bridal fashion and trending aesthetic inspiration. We of course had to include the Pantone colors of the year, Rose Quartz and Serenity, but chose to loosely use them throughout to add a different design spin. The other top wedding trends we highlighted are… Lose, organic floral arrangements and bouquets. Seasonal flowers with a variety of textured foliage is still on trend, as well as foraging. We loved using giant artichoke leaves as well as fragrant jasmine and the popular protea and air plants. There is also emphasis on pushing creativity with displays. Paige Schmitt, The Mad Florist, helped achieve this look with her amazing talent and style! 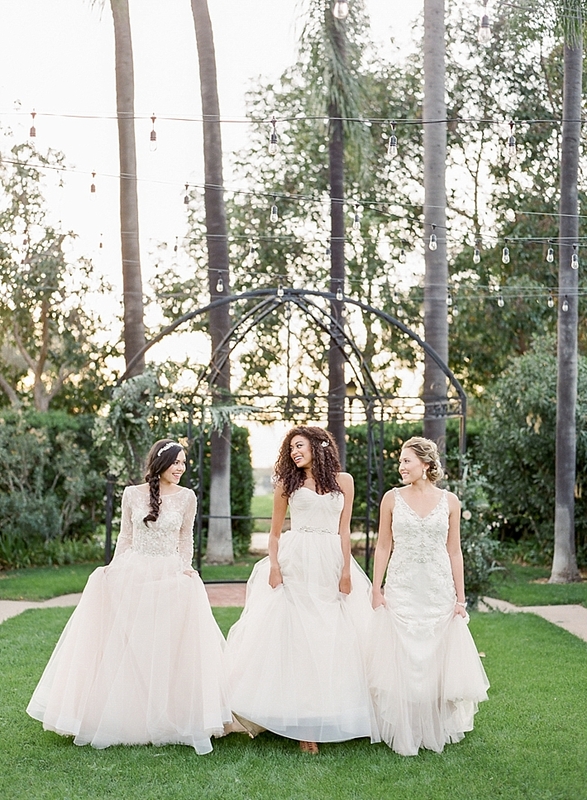 For our shoot, we chose stylish gowns from top designers Jim Hjelm by Hayley Paige, Eve of Milady, and Badgley Mischka. Think lots of lace and floral applique this year! With Mary Me Bridal’s stylist, Hope Stanley’s expertise the choices are flawless! We always love styling with Sundrop Vintage pieces. For this shoot we chose their furniture pieces that would best compliment the Pantone colors of the year and they did! The Woodard Collection for the bar lounge makes me smile - big! Their vintage plates with delicate rose quartz details and serenity goblets were the perfect pair. Cakes are truly an art form in themselves, especially when it comes to those made by Maria, owner of RooneyGirl BakeShop. With multi-layered cakes on trend, each layer offers itself to a separate expression in style, mixing and matching colors and textures and making sure each tier counts. Think of it as each tier as having its own personality. We incorporated crystals, quartz, and geodes as well as copper and marbled fondant. Maria incorporated all of these elements into her incredible design and brought our vision to life, impeccably! When it comes to paper goods in 2016 consider shine and texture with gilded calligraphy, always calligraphy, in copper or gold tones. Calligraphy remains a strong trend, that we don’t see going anywhere anytime soon. Who doesn’t want pretty and romantic lettering on their invitations?! Darla Vietti, Darla Marie Designs, chose copper and rose quartz to use in our lovely invitation suite. Marble is also trending and adds cool tones and textures. We used cut pieces of marble to display our menus and place cards. Adorned with copper calligraphy by Pirouette Paper. We anticipate copper accents popping up more this year in addition to the ever popular rose gold. Beauty and the Beach was onsite to get our models glammed! Natural and romantic are still the buzz in bridal hair and makeup. Braids are still in and are becoming more intricate, so we created a one of a kind braided up do, and multi braid fishtail as well as accentuating some amazing natural curls! In makeup matte and long lasting are replacing sticky high gloss lips. We opted for bright springy colors for a cohesive look. The rest of the makeup was kept soft and nodded to the 2016 Pantone colors.